Republic has Jan Fan units in stock to keep your facility cool and efficient this summer. 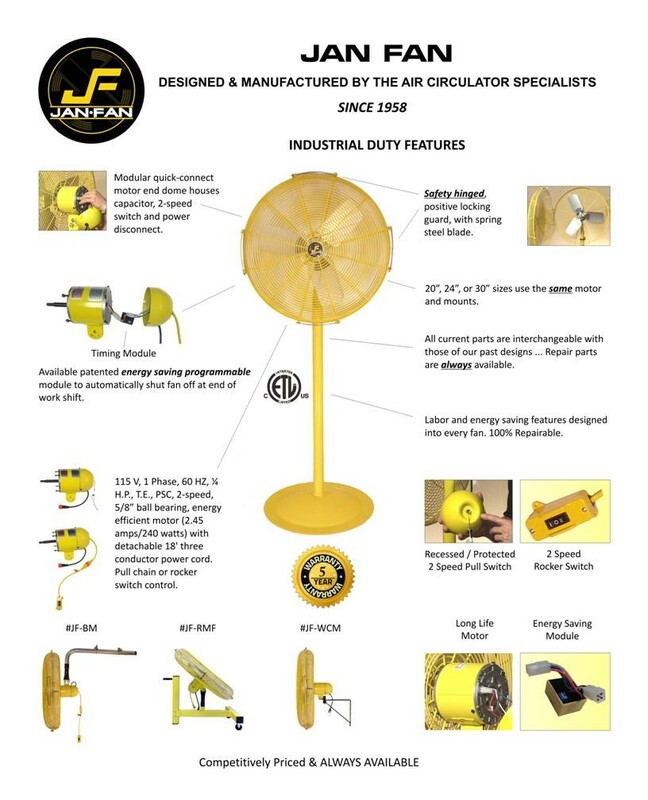 Jan Fan boasts the most energy efficient, maintenance free industrial fans on the market backed by a 5-year warranty. Jan Fan is a leading manufacturer of industrial fans that include: pedestal, wall & ceiling fans, I-beam / c-channel fans, floor fans, bench fans and the energy saving module. Their heavy duty industrial fans are considered the automotive and heavy industry standard. Since 1958, Jan Fan has been manufacturing industrial and commercial fans that are extremely energy efficient and built to last. Each fan comes with a standard 5 year warranty. View the Jan Fan product demo video here or contact Republic at 563.322.6204 or elecorders@republicco.com to schedule an in-person demo.